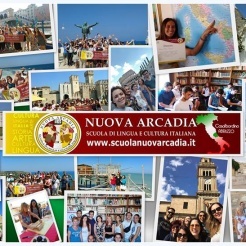 Nuova Arcadia Italian Language School for foreigners has its headquarters in Casalbordino, in a modern building in the centre of the town and in an elegant palace with meeting room and public library. Our headquarters are provided with multimedia supports, cine-movie, library, teaching materials, internet point, and all is available for the students for free. All our teachers are graduates in foreign languages and italian culture. They have many years of experience and all of them are PLIDA, CELI, CILS examiners and everyone has got the competence certification in teaching Italian.